Happiness can be elusive or it can come in spades. We don't really know why our lives ebb and flow this way, but they do. Professionally, the key to finding bliss is to look for a career that allows you to get the positive feedback you crave. Enough of this positive feedback and we experience bliss. Is my explanation of bliss too utilitarian? Perhaps. But when I saw Dr. Will's video post to kick off this month's #beyouEDU theme, it struck me that he is finding joy in his interactions with teachers. He is getting to know them and helping them find a new level of satisfaction in their own teaching and lesson planning. Being in the midst of their excitement as they go through this change gives him the feedback that leads to bliss. Here are some of the ways my professional life gives me a chance to feel bliss in this same way. Until two months ago, my entire adult career has been focused on being a middle and high school history teacher. My bliss came from telling the stories of history in a way that got my students eyes to shine. It came from creating a project-based learning experienced that helped teenagers dig into a political or social issue and feel real emotion when they learned about injustice. 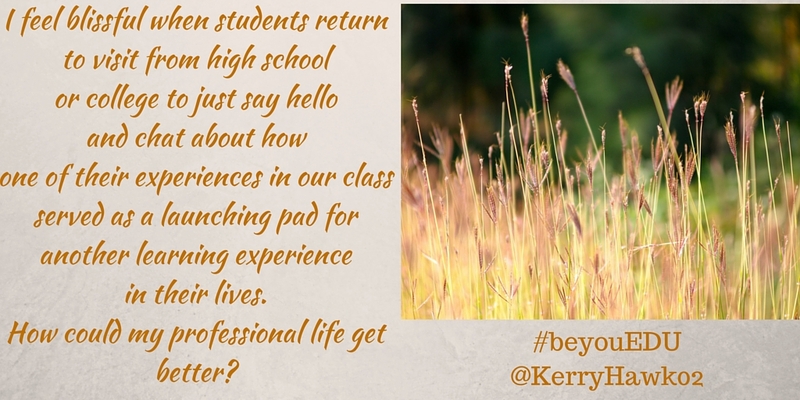 I felt blissful when students returned to visit from high school or college to just say hello and chat about how one of their experiences in our class served as a launching pad for another learning experience in their lives. How could my professional life get better? About two years ago I was offered the opportunity to write for EdSurge. I was at a conference and had been placed on a panel with one of their leadership. I mean, my blog had been up and I'd been writing there -- mostly for myself -- for several years. But to be asked to write for a farther reaching publication... I was honored and thrilled. Turns out, I kind of like this writing thing. Since then, I've written quite a few articles for EdSurge and lots of other online education publications. Writing has helped me find bliss because it forces me to process my pedagogy, reflect on my practice, and share my experience with an honest voice. In an education landscape filled with policymakers and leaders who choose their words oh-so-carefully, sometimes we all crave an honest voice. It feels pretty good to be that honest voice. Writing about education and technology has been a pathway to bliss for me. Speaking at conferences and symposiums about education practice and the role of technology is something that started small for me. My former district hosted a regional conference each spring and that is how I got my toes wet. Then, through a cohort experience with my colleagues, and encouraged by my superintendent, John Doherty, I proposed sessions at MassCUE, our state conference. From there, with the help of my writing, I'm now sometimes proposing and sometimes receiving invitations to speak about my experiences and my ideas. The joy I find in attending and speaking at these events isn't usually about the moments when I'm on the microphone. Rather, it is about the conversations that precede and follow. I love to hear what people are thinking about the topic before I get up and share my own perspective. Then, I love to hear their feedback in the small group conversations that happen between sessions or after hours over cocktails. To me, speaking at conferences is what I do so that I can do what brings me bliss: so that I can have a chance to talk with people I would normally never get to meet and hear ideas I would normally never get to hear. It feels good to soak in something new, and know I can bring it back to my school to help all of us grow. I'm only about two months into this new role as a full time digital learning specialist. My job is to make sure teachers have everything they need to get a creative and enthusiastic as possible. Sometimes this means removing barriers and sometimes this means helping them see that there is so much more available to them than they ever knew. So far there have been quite a few joyful moments, and many moments of listening and learning. I have much to absorb before I can think of being an expert in this field. For now, I celebrate small victories, like when I can show a teacher a new faster way to give students feedback on their work using the tech tools we have available at our school. These little celebrations will grow -- I have faith, as my knowledge and experience grows -- into bliss. Of course, I always write for #beyouEDU from the educator perspective. But Dr. Will's monthly topics can apply to any profession, or any person. The themes are broad enough to allow anyone to participate, and specific enough to cause me to reflect on my own personal experiences each month. Join the movement and #beyouEDU today.